1. 1 in 10 people lack access to safe water. In 2015, 663 million people, or 1 in 10, lacked access to safe drinking water sources. Nearly one-half of all people who are forced to rely on unsafe drinking water live in sub-Saharan Africa. 2. Every 90 seconds a child dies from a water-related disease. Preventable waterborne diseases wreak havoc on communities by causing death, wide spread infection, and cognitive and physical impairment among the young; it is a staggering waste of human potential. 3. Globally 1/3 of all schools lack access to safe water and adequate sanitation. 4. 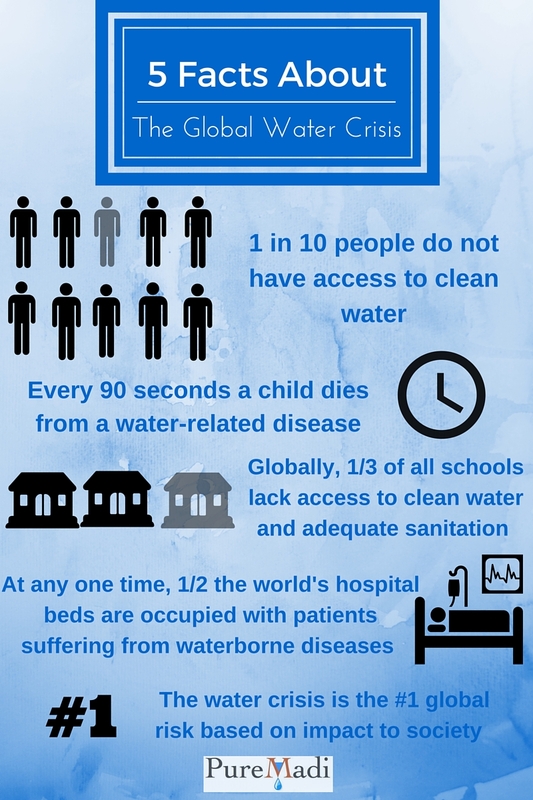 At any one time, one-half of the world’s hospital beds are occupied with patients suffering from waterborne diseases. 5. As announced by the World Economic Forum in January 2015, the water crisis is the #1 global risk based on impact to society (as a measure of devastation). Many organizations are attempting to find solutions to this problem, from drilling wells and building slow sand filters, to creating point-of-use technologies, such as household filters and disinfectant tablets. PureMadi is proud to be one of these organizations; we are putting the solution in the hands of communities by building ceramic water filter factories, employing locals, and enabling them to produce and distribute ceramic water filters that will purify a family’s water for 3-4 years.